My favorite combo is Seven Seed mix and harissa. Harissa has quite a kick to it. Like hot sauce, it can vary in temperature from one brand to another. If you have never used it before -- be fore warned! I like to use it with potatoes because the plain starch of the potato takes care of a lot of the heat. 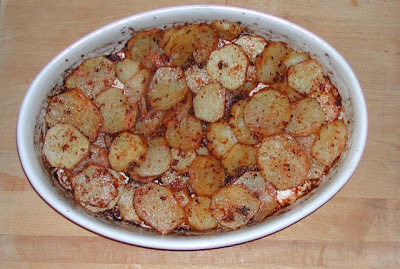 In a large bowl, sprinkle the sliced potatoes with the toasted Seven Seed mix. Add the harissa and oil and mix till coated. This is an interesting side for a roasted chicken. If you don't have harissa, sprinkle on a tablespoon of a smoky paprika or red pepper. If you don't want to wash an extra bowl, just mix it together in the Baking dish. Try these Seven Seed Harissa Muffins for a spicy and complex corn bread. Mix the corn meal, milk, egg, and harissa together in a small bowl. Fold in the toasted Seven Seed mix. 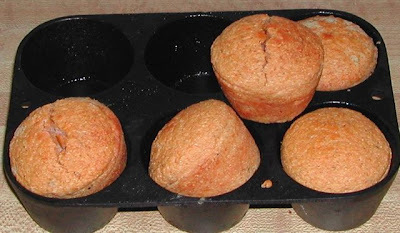 Generously oil a muffin tin (preferably cast iron) with the vegetable oil and place it in a 400 oven. Let the muffin tin sit in the hot oven for about 5 min. Bake for 20 minutes, until the tops are browned. It makes about 12 muffins. 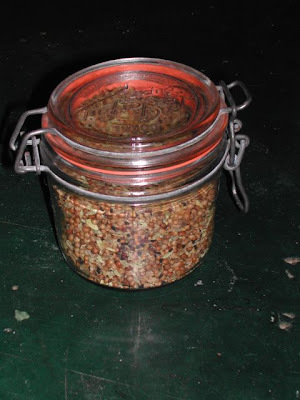 Give this Seven Seed Mix a try!